In Filipino cooking, the dining table is a virtual extension of the kitchen. Cooking doesn’t end when the fish has been grilled, when its skin has charred. It doesn’t end when the pork has simmered, when the stew has been ladled into bowls. Cooking extends beyond the kitchen and into the dining table where everyone is encouraged to take part in preparing the meal. It extends into one’s plate, into one’s hands, if one chooses to indulge and eat with bare hands, where the taste and texture of the food are adjusted to one’s liking using the ever-present sawsawan [sou-sou-wuhn]. Sawsaw [sou-sou] means to dip in Filipino and sawsawan is the assortment of sauces and condiments always present in every Filipino meal. It can be a dipping sauce like patis [pah-tis] and toyo [toh-yò]. It can be a garnish like sprigs of wansoy [wuhn-soi] and slivers of green onions. 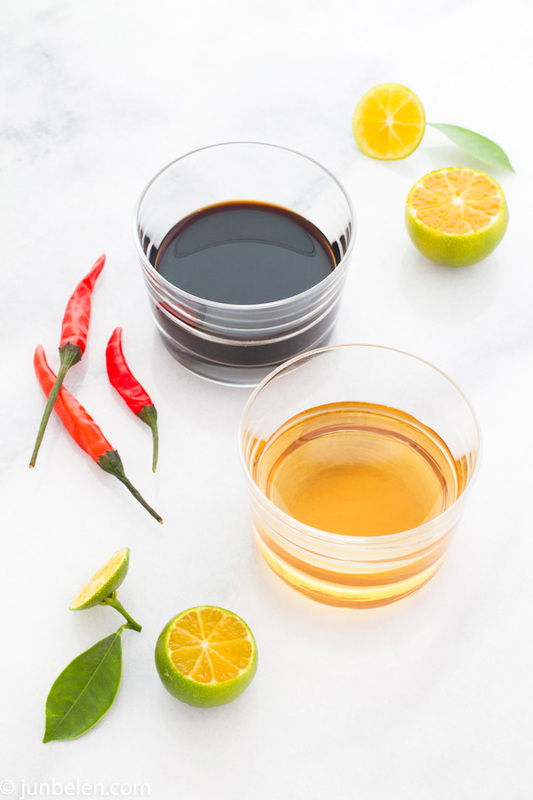 It can be a marinade like toyomansi — toyo and calamansi combined together to flavor meats like chicken and beef. It can be a side dish like a medley of green mangoes with tomatoes, shallots, and itlog na maalat. It can even be a meal by itself accompanied with rice, of course, like burong mustasa [boo-rohng muhs-tah-sah] or pickled mustard leaves sauteed with eggs and the trinity of garlic, onions, and tomatoes. 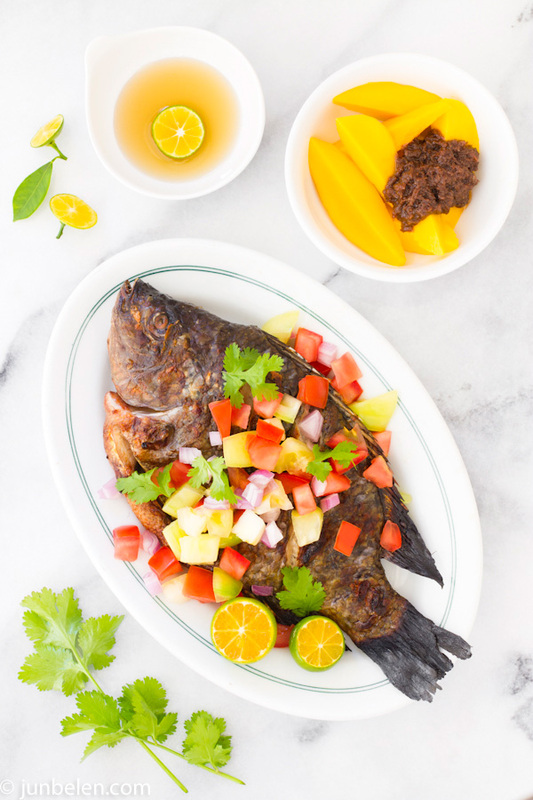 With the suitable sawsawan, the sour is tempered with the salty: green mangoes with bagoong alamang, and the salty with the sour: dried, salted scad or mackerel with suka [soo-kà]. The sawsawan can be as simple as a squeeze of calamansi in patis that accompanies bulalo, the soup of beef shank and beef marrow. As simple as a dash of worcestershire in banana ketchup that makes a meal of Max’s fried chicken complete. Or the sawsawan can be a sophisticated blend of sauces, aromatics, chilies, and spices with complementing layers of taste and texture. My dad dips everything in vinegar infused with garlic, black whole peppercorns, and chilies. Burnt Lumpia swears by his Ilocano sawsawan composed of tomatoes, bagoong isda, and shallots. A good friend from Cebu grills fish seasoned simply with sea salt and cracked black peppercorns but assembles an elaborate sawsawan made of vinegar, soy sauce, and calamansi with a pinch of sugar, a sprinkle of finely chopped shallots, and crushed siling labuyo. The combinations are countless. Every sawsawan is unique just as everyone’s palate is unique. When I was little I was so enamored of the Lazy Susan on our wide, round dining table. It twirled busily at every meal and I was so fascinated whenever I got the chance to spin it. I knelt precariously on my chair, rested my left hand on the table, then spun the Lazy Susan around with my right. There was always a big bowl of rice on the Lazy Susan. Oftentimes, there was fish, usually fried. There was either soup like nilaga or vegetables sauteed in a simple guisado to accompany the fish. And there was always sawsawan. Patis with calamansi. Suka with siling labuyo. Everyone had a small dipping dish with his or her own sawsawan. Everything was shared, family-style. The best way, the only way to enjoy Filipino food. 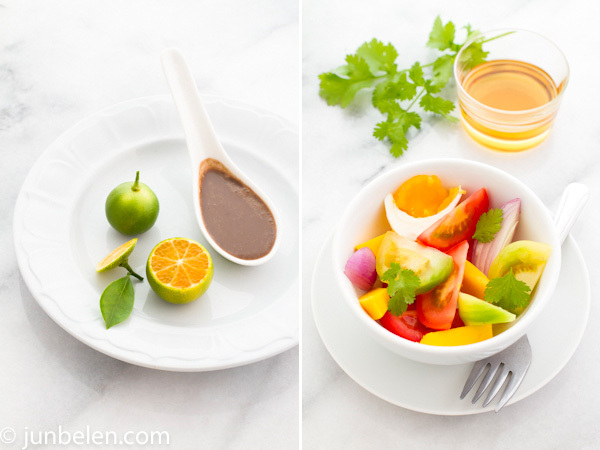 From top to bottom, left to right: patis (fish sauce) with calamansi; green mangoes with bagoong alamang (salted, fermented shrimp paste); grilled tilapia with tomatoes, onions, and wansoy (cilantro); suka (vinegar) with siling labuyo (Thai chilies); sriracha and banana ketchup; bagoong isda (salted, fermented fish paste) with calamansi; green mango salad; patis and toyo (soy sauce); green mangoes with bagoong alamang; patis and toyo with siling labuyo and calamansi. What is your favorite sawsawan? Great choice for letter S! So essential to the cuisine! I owe you a recipe for sisig. Thank you, Nancy. Sawsawan plays a big part in my meals, and a sawsawan can totally change the game in one dish, metihinks. Love this, Jun! My earliest memory in the kitchen was cutting calamansi into small halves to be added to the condiments spot when we had gatherings. I always wondered “why so much calamansi?” Now I have written evidence online that adding a bit of Tapatio to banana sauce prior to eating fried chicken is built into my nature. Great post and I love all these photos, which are all my favorites! You’re amazing, Jun. Thanks for putting together a very informative piece. Bookmarking this one for reference. Happy Memorial Day weekend! I can’t help but drool over the incredibly life-like photos in this post! The colors are incredible, especially of the beautiful calamansi! Makes my mouth pucker happily. Thank you for the beautifully written post- I think THIS post captures the essence of Filipino cuisine more than anything else. I love all the different kinds of sawsawan and am intrigued by the fermented mustard leaves…sounds like our version of kimchee. Thank you, Darlene. Yes, it is part of our nature to dip that piece of fried chicken in banana ketchup before wolfing it down. YAY!! this makes me smile!! love sawsawan! i can’t live without them. 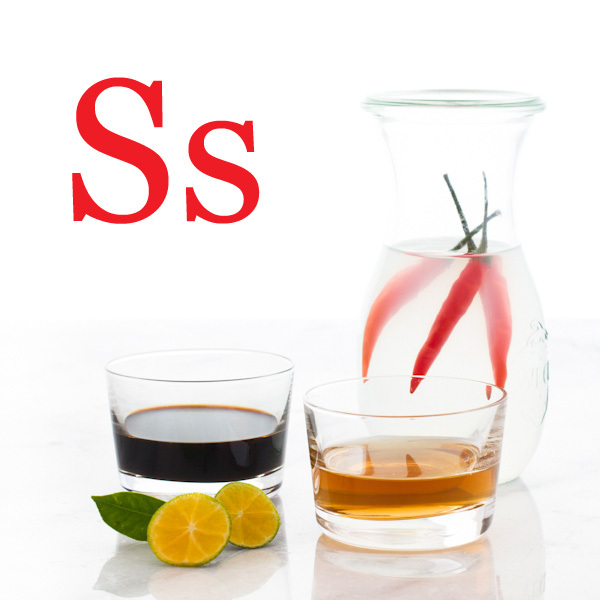 S for sawsawan is perfect!! When it comes to sawsawan for fish, my first pick will always be bagoong balayan. If there’s none, that’s when I’ll settle for the soy sauce/vinegar/garlic/onion mix, with some side dish of finely sliced tomatoes. The same soy sauce mix also works well for fried or roasted beef or pork. Sometimes, I’d make a lot and keep it in a bottle because it tastes better the longer you let it sit. Vinger and garlic is also great. Hay. I’m hungry again hehe. Sawsawan never looked so good! Wow, I love this series of yours. I am learning a lot about Filipino cooking through blog Jun. Brilliant pictures as always. 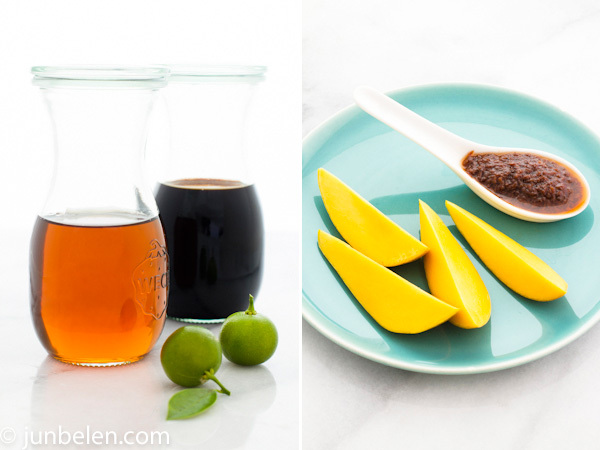 Love bagoong Balayan with talbos ng kamote! It’s like a perfect match for me. And yes, soy sauce is so versatile. It can be a dipping sauce or a marinade. Instead of vinegar I like adding calamansi to soy sauce for toyomansi! Thank you for writing! It’s about time the world knows that Filipino food can look beautiful. I’m so excited you discovered my blog. Please do come back and try out the recipes. This post made me smile. My family’s usual sawsawan consisted of a base of tomatoes and cilantro. Usually, all that was needed was a sprinkle of salt, but once in a while, we’d go with a dash of toyo or a bit of bagoong alamang. Sometimes, this mix was enough to eat with rice, no meat required. Simple, but delicious. I’m happy you enjoyed the post, Row. I make a meal out of just rice and bagoong alamang with tomatoes, too. Simple, but delicious and satisfying. I love the bagoong alaman on eggplant. 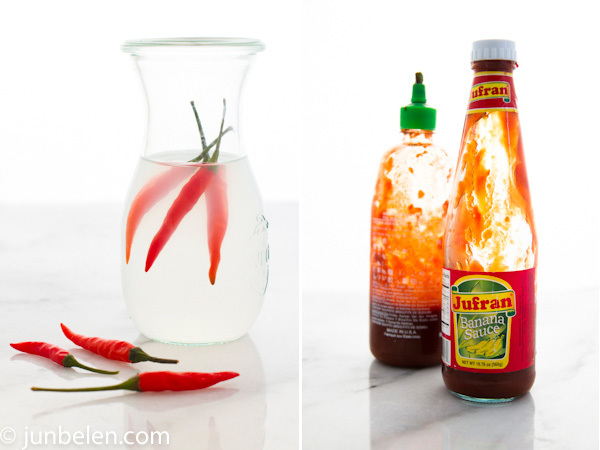 I also like suka with the chilies! My dad’s backyard in the Philippines had chilies so we’d just go outside and grab some! It’s a great sawsawan for balut. Love this post! Thank you, Jan. My dad loves suka with lots of siling labuyo, too. He pours it on almost everything. You can try this new soy sauce I recently discovered – La choy, my mom sent me this from the US because she couldn’t find any of the usual soy sauce for the philippines. She said it was nice and I totally agree. Thank you for the tip about La Choy! So happy I found your blog while searching for a “filipino recipe with sago.” I followed you on fb right away. A Filipino blogger with passion for food, a style of writing that rocks, a savvy for photography and skills in internet marketing is just so admirable. About this post: Rice and fish is indeed a perpetual combo, with sawsawan as the quintessential dip. An American neighbor was warned by his friends of his Filipina fiancee thus: “She will rice you to death.” I think we eat far too much rice. Maybe it’s time we eat more of the nutrient-dense herbs like garlic, onions, scallions and tomatoes. And never without the duo of toyo and calamansi.